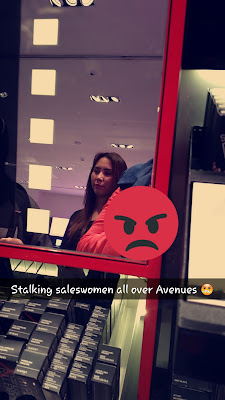 One of the worst things I hate to encounter when I shop is sales people who stalk you. My friend and I were in Sephora in the Avenues and could not shop in peace. I get it..you work for commission but that doesn't mean you have to continuously bother people to make the sale. As soon as we walked in they started, first asking if we needed help, thank you but when we need your assistance we will let you know. As we move on to a different brand another one comes up and asks the same and we replied the same. This happens all over Kuwait, I guess they don't know about personal space and like to walk behind you and fix everything you touch. I was in Juicy Couture looking at some shirts, every hanger I touched the sales lady fixed as if she had OCD or something. I know a lot of people don't know about their products in this country, I get it but that doesn't mean you have to lurk behind someone when they tell you they don't need your help. 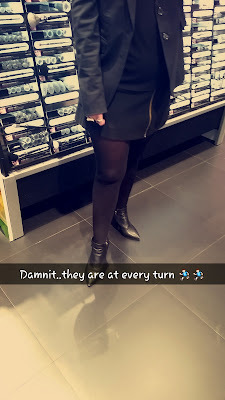 Recently I was in the party store in Symphony mall and I felt as if the sales people were waiting for me to steal some balloons or something by the way they stared at me. It was totally uncomfortable and I ended up leaving the store because of it. Stop being so pushy! Oh, the Oasis in The Avenues is guilty of doing this. Actually, when I think I about it, I feel like I'm hounded in mostly Alshaya stores. I was going to put out the same info that it happens a loooot at Avenues but they already hate me and threaten me whenever I post anything negative. They have a special media FBI department that searches the internet for negative info on Al Shaya. Omigosh I hate that too! I was going to buy a washing machine... this nice no-pushy guy was helping just fine, then a pushy sales guy took over, started showing me stuff I insisted I didn't want and I just left.... I'll go back to the first (not annoying) sales guy when the other dude is on break or something... I hate people who follow, tell you stuff you didn't ask, try to direct you to what you aren't interested in, and don't leave you alone to decide!!!! Where is the lie?? This is the exact same problem I have when I go to stores. The only places store employees dont bother you are supermarkets and bookstores. AL SHAYA are the pits! You once said that you wear a hijab! Well hun, that's your problem! They would not be harping on you if you were a regular looking white girl! They'll be SWEET AS PIE! AS AMERICAN PIE! Friend and I go to an Al Shaya owned restaurant, PIZZA EXPRESS, at the airport. Manager and waiter continually asked my very white friend Claire if everything's alright every 15 minutes. She was puzzled because they didn't bother asking me (a dirty Arab) even though I was sitting right in front of her and they didn't ask ANYONE else in the restaurant! Let me tell you something, this was her first hour in Kuwait ever and yet she became fully aware of how disgusting White Privilege is here within that hour. She was appalled. 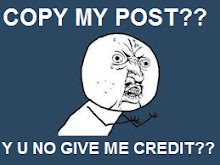 Yes I am PO'ed right now, sorry, had to do some venting. Sorry about what happened to you. It happens to all of us. You are cool. Much love. Good subject to post about. I hate it even more when the salespeople are men. Debenhams used to be the worst! They are better now after massive complaints. I was in their store once and they were so threatening to a nice looking older Kuwaiti woman that she left in tears. It was like wolves on a chicken! I just shout "BACK UP!" Or "STOP TOUCHING ME!" They usually run away. (Giggles) love, angry white woman. It's like a marathon race trying to avoid them. While walking in the mall I veer to the right or left as soon as I see the perfume displays. debenhams is the worst to enter i am talking abt the women side, With the perfumes and cosmetics those sales people hound from right left and center. I don't even bother to look at them and walk straight to the safe side(clothing area).